Hurrah! 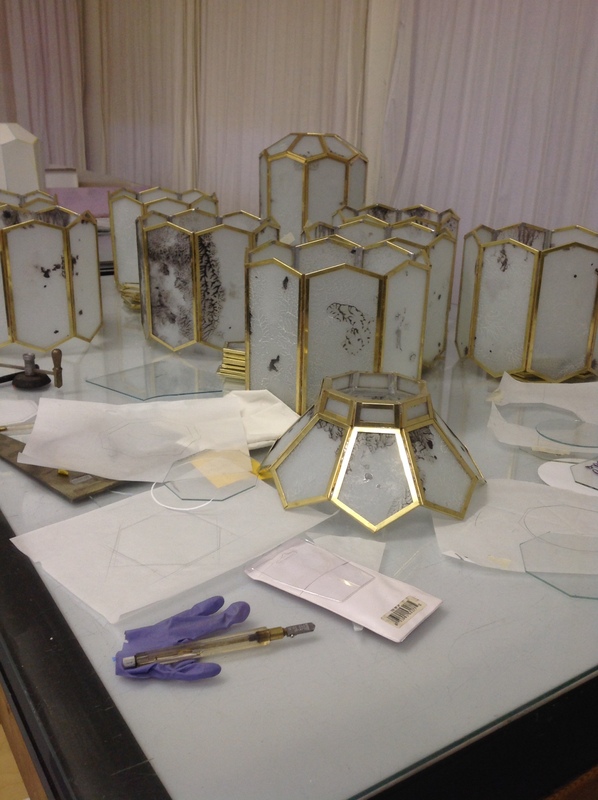 I finished assembling the lamps for Filthy Lucre this afternoon. Above: 296 pieces of hand-painted glass, framed and soldered into brass channel. 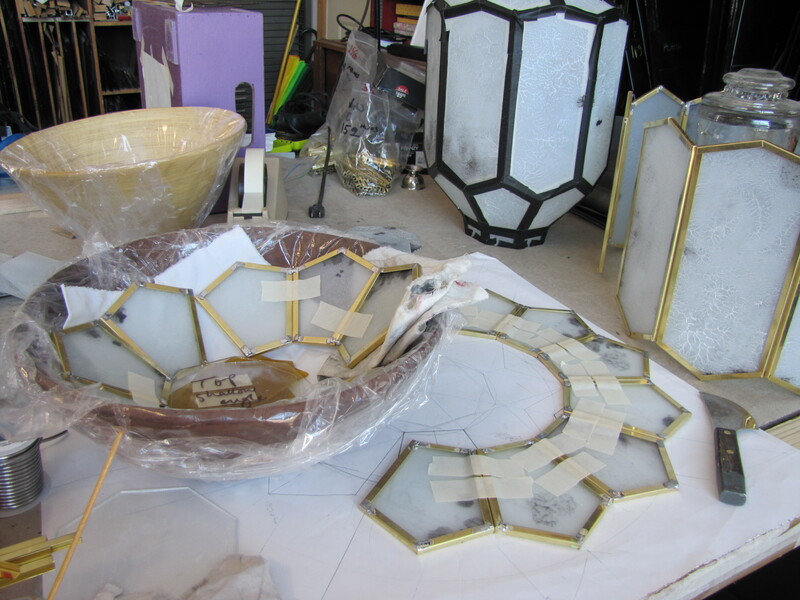 …with masking tape holding the pieces of glass together. Moving on to a cut-down 5 gallon plastic bucket and some masking tape; Necessity is the mother of invention! 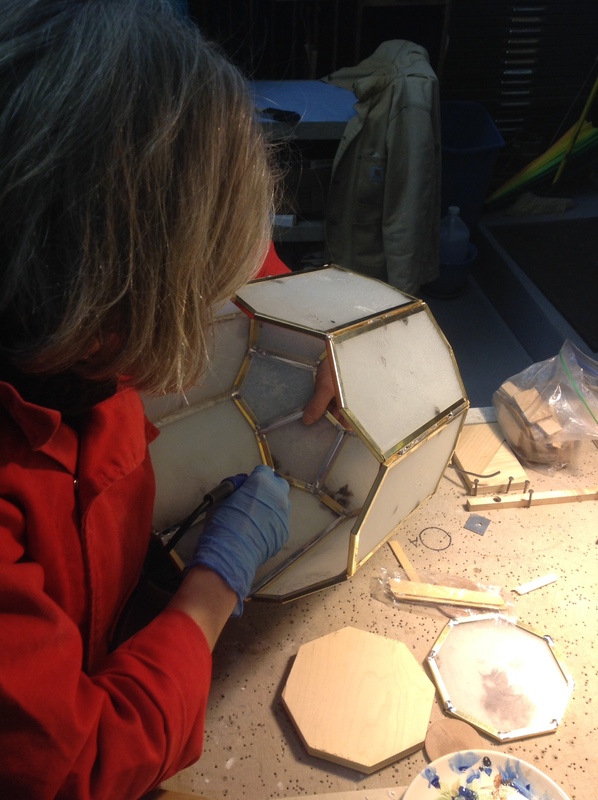 With some jig-sawed plywood (circle inside, and octagon on top) we made a perfect jig for soldering. 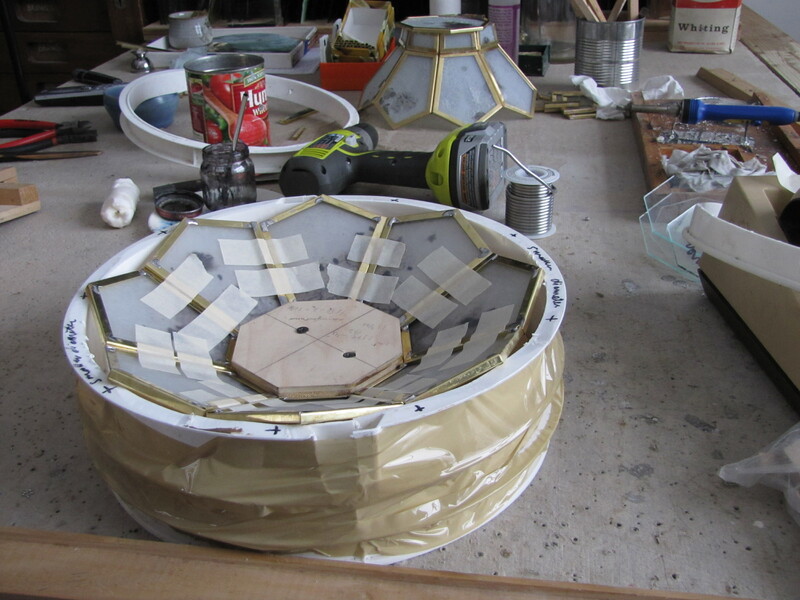 More plastic bucket, cut into bands to hold the center barrel of the lamp together. I bought a little Hakko 601 soldering iron that would fit inside the lamps for finishing the final seams. At this point everything is just tacked with blobs on the corners. I’m using 60/40 solder which seems to work just great with the brass. Beginning to run solder the lengths of the seams. 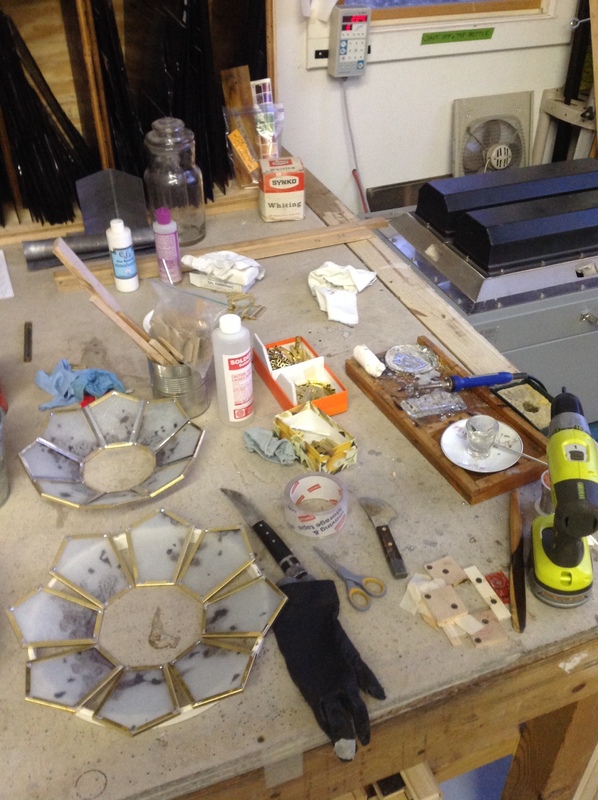 Notice the little jig screwed to the bench in the foreground for bordering the smallest pieces of glass. Also boxes of short brass channel. This is the bottom of the lamp (upside-down on the table), where one removable pane will be positioned for ease of changing light bulbs. 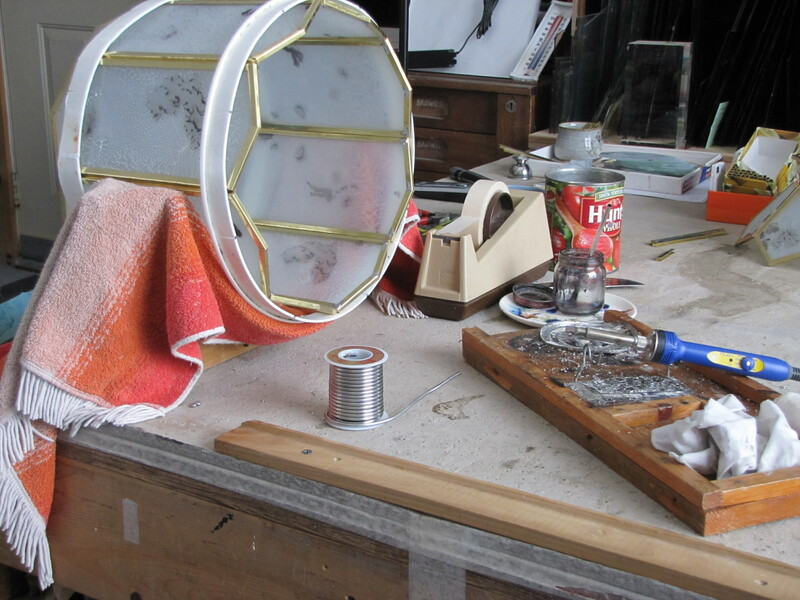 The L-shaped lip, soldered from eight pieces, has to be perfectly flat to hold the loose pane neatly in position. Calculating the exact size of each loose-fitting pane took a little experimentation. It had to fit through the opening edgewise, turned to lay flush with the brass lip, and then stay there without falling out. Trying not to inhale zinc fumes given off when soldering brass. Awkward! 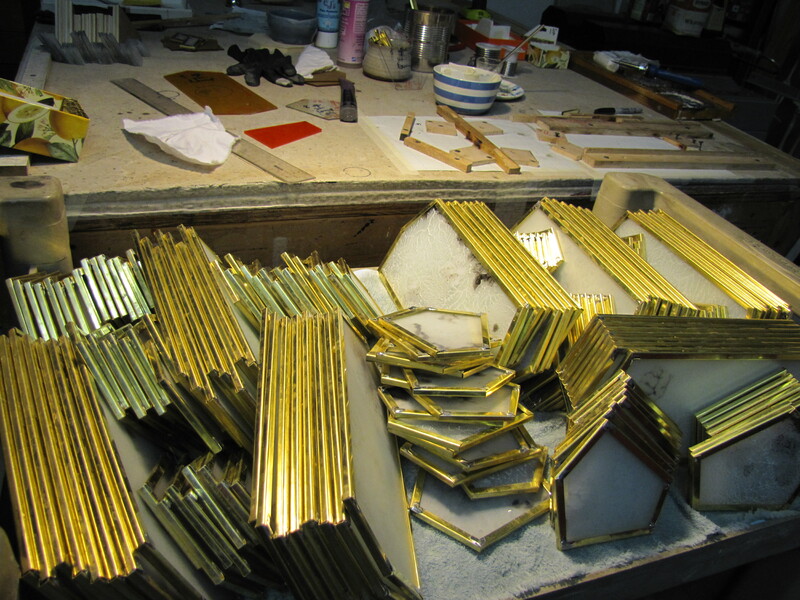 All soldering must be done on the inside so that the exterior remains brass. The gold colour is all part of the spirit of Filthy Lucre. The first lamp completed, with a lathe-turned poplar ‘neck’ that provides a conduit for the wiring. 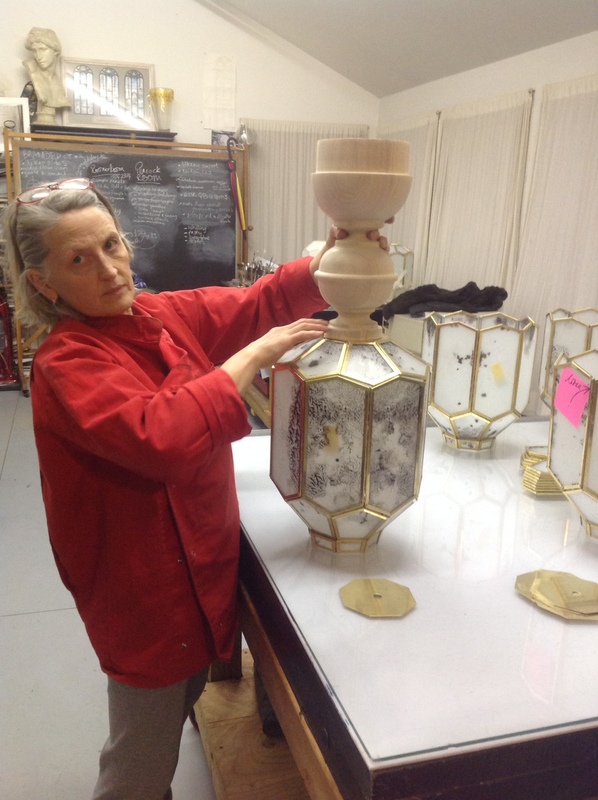 Period Lighting Fixtures of Clarksburg, Massachusetts sheared and crimped all the brass channel for me , and Chris Burda (my lamp building guru) advised on techniques and procedure. I learned a lot! Filthy Lucre is the major artwork in Darren Waterstone’s upcoming exhibition Uncertain Beauty at MASS MoCA. Watch 2 min video with photos of Whistler’s original and some of Darren’s drawings, or his interview with Berkshire Fine Arts. This hugely ambitious and extravagant work of art, a massive 20ft x 33ft room, is a contemporary re-imagining of James McNeill Whistler’s 1876 decorative masterpiece Harmony in Blue and Gold: The Peacock Room. 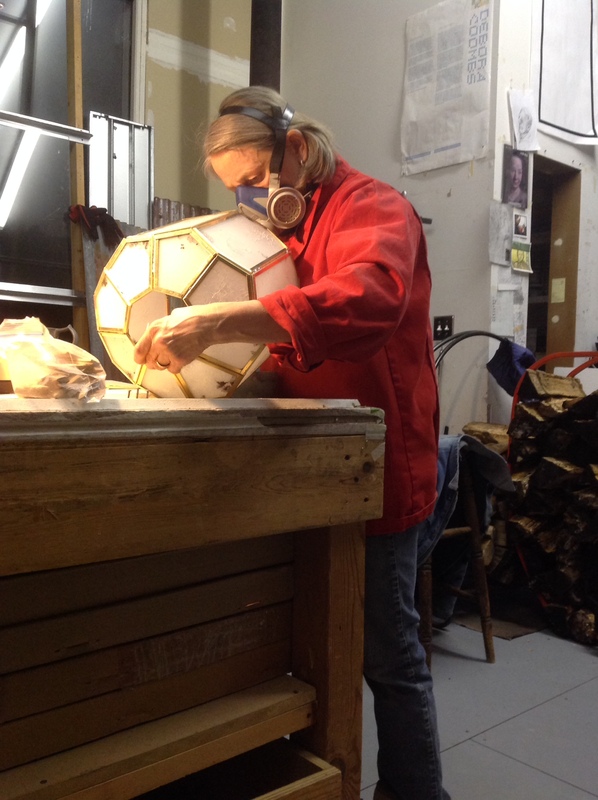 It’s being fabricated at MASS MoCA and will be shown there for almost a year before traveling to the Smithsonian to be exhibited alongside Whistler’s original. 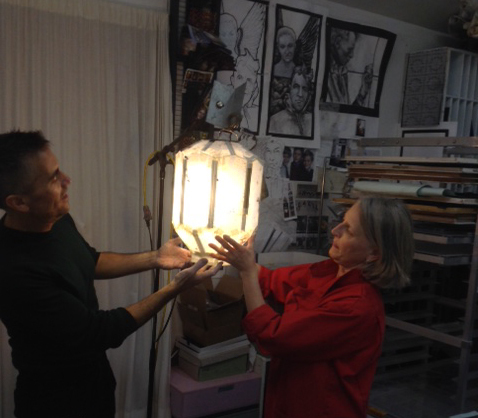 The lamps are the only light source for the installation, and a key player in Darren’s overall vision of decaying splendor. 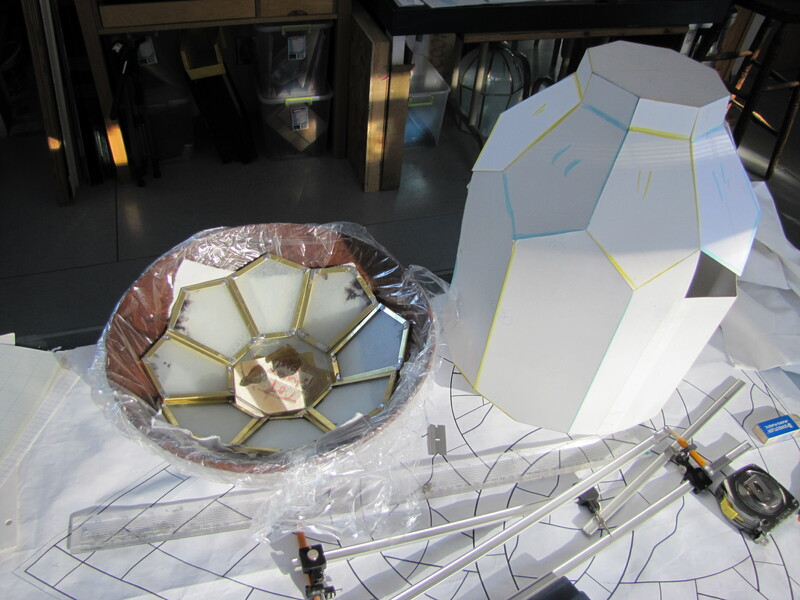 Mock-up in glass with pieces of cardboard model in the background. It took me a while to figure out the geometry of the lamps, which are faceted to resemble the proportions of those in the original Peacock Room. I started with a ruler and compasses on paper, then cardboard and foamcore, and finally a full-size mock-up in scrap glass (orange and yellow Kokomo!) stuck together with masking tape. 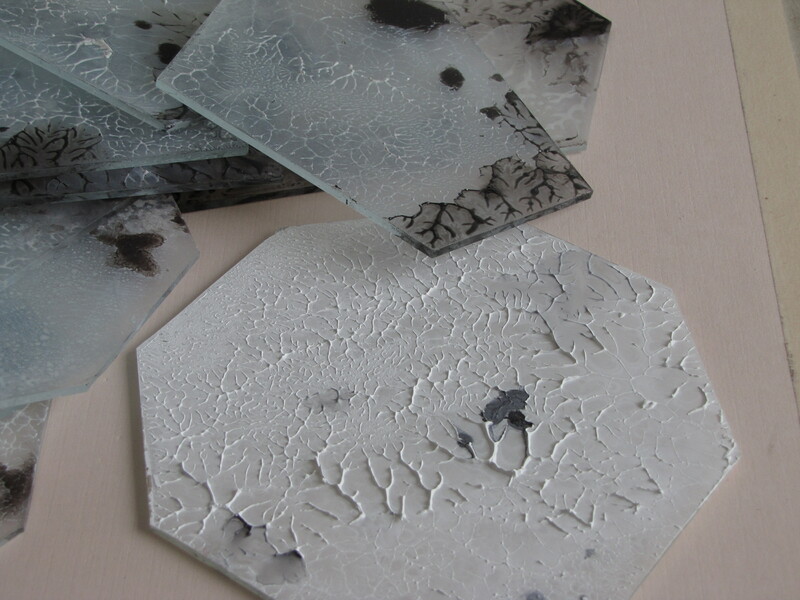 Darren loved it, so out came my trusty Morton System (a wonderful tool for cutting multiples of precisely the same shape) and I started chopping into some big sheets of 3/16 float glass. 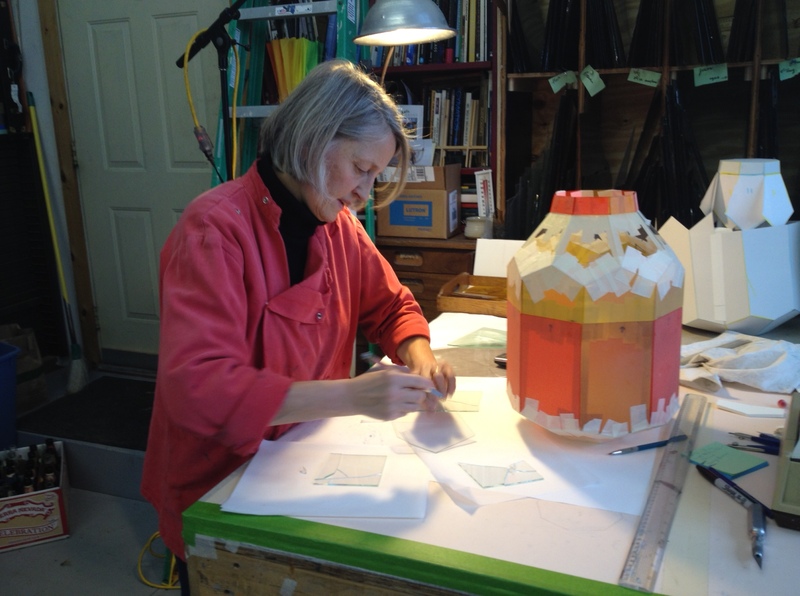 Darren is painting every surface of Uncertain Beauty, including the floor, 13ft coffered ceiling, and hundreds of objects – including the lamps (it’s a wonderful project -see photos on his blog and Pinterest). After a brief introduction to my glasspainting methods and a little experimentation he settled on decalcomania, a technique used by Max Ernst and other surrealist painters during the 1930’s. The effect is created by squeezing two smooth surfaces together and then pulling or peeling them apart. 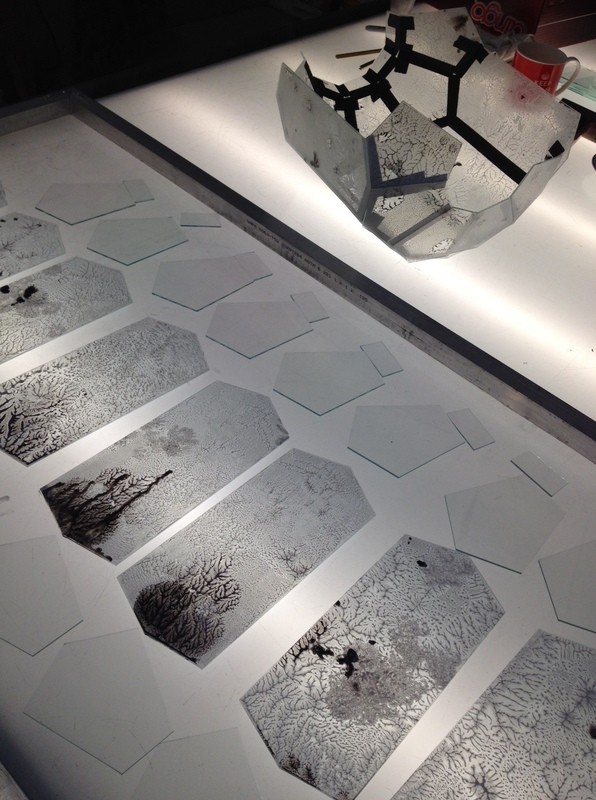 The printed surfaces of the glass, laid side by side, look a bit like irregular Rorschach tests. I mixed and slaked a new batch of white Reusche enamel with propylene glycol a week before Darren turned up at my studio to paint. He used this, plus some of my usual tracing black and bistre brown grisaille, adding drops of water and/or prop. glycol to guide the flow and blend colours. 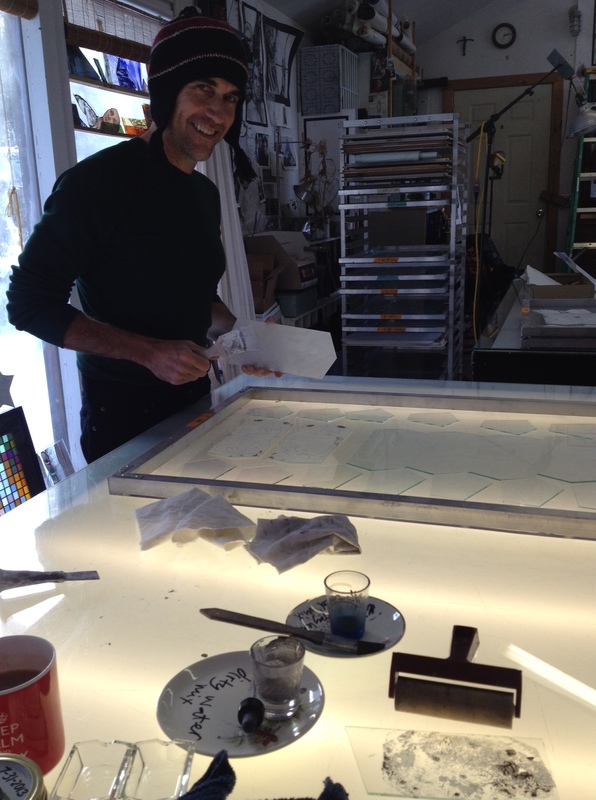 Darren painted all 297 pieces of glass in one long day at the studio – and was cheerful throughout!